Wingstop had served more than one billion wings as of 2010. 4 How Many Calories in Domino's Buffalo Wings Plain? Starting in the late 1990s at the Buffalo Wing Festival, Wingstop has served over one billion wings as of 2010. Wingstop gives credit for its success to its offering of a variety of flavors that are made fresh and do not sit under a heat lamp. Along with specializing in wings, Wingstop serves side items to complement the wing flavors. The nutrition information for Wingstop depends on the ingredients and cooking methods for each item. Wingstop serves regular wings along with boneless wings and boneless strips in nine flavors, including atomic, Cajun, original hot, milk, hickory smoked barbecue, lemon pepper, garlic parmesan, Hawaiian and teriyaki. To complement the choices of wings, Wingstop offers side items. Idaho potatoes are cut fresh daily for the french fries and other side items include homemade potato salad, coleslaw and bourbon baked beans. Calories and the fat, carbohydrate and protein content depend on the ingredients and cooking methods. Wings will contain a balance of fat, carbohydrates and protein. The traditional flavor, for example, contains 110 calories per serving of two wings including 6 g of fat, 7 g of carbohydrates and 8 g of fat. French fries, however, contain primarily fat and carbohydrates for 200 calories per serving with 31 g of fat, 67 g of carbohydrates and only 7 g of protein. Wingstop uses several features for a specific flavor and wing experience. For example, the wings are never breaded and only tossed and sauced in the wing flavor of your choice. The boneless wings and boneless strips use 100 percent all-white meat. Wingstop also prepares and cooks every order of wings according to your order and also cooks fresh French fries and potato salad daily. Despite containing significant amounts of calories, fat and carbohydrates, some of the menu choices at Wingstop contain vitamins, minerals or nutrients. Traditional wings, for example, contain 1 g of dietary fiber and 0 g of trans fat. French fries contain a significant amount of potassium, with 1,164 mg per serving. By preparing the food according to your order, you can make personalized adjustments to improve caloric content. Controlling the serving size by limiting the amount of wings and side items is one way to reduce the number of calories consumed at Wingstop. Order sauces on the side and split side items with others to reduce calories, fat and carbohydrates. 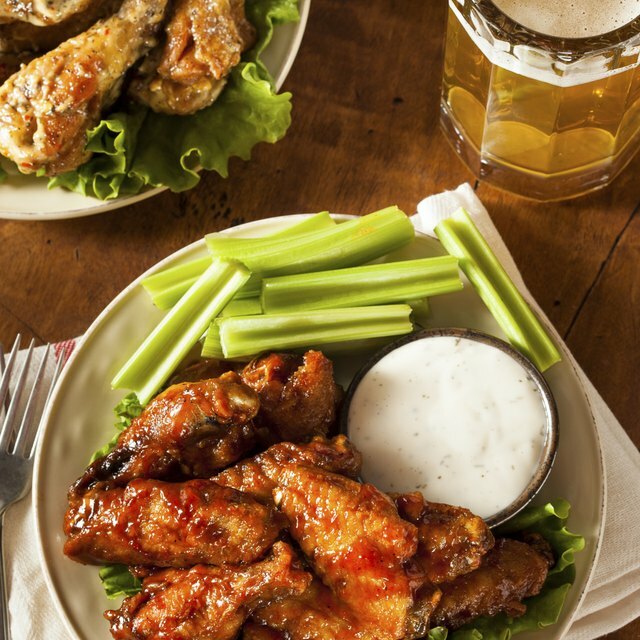 Do You Put Hot Sauce on Wings Before or After You Cook Them?